This junior in college is looking to make a difference in the world. Yasmine Arrington may be a junior at North Carolina’s Elon University now, but seven years ago her chances of ever being able to afford college looked bleak. The 20-year-old’s mom died when she was just a freshman in high school. Her father—who has since been released—had been in and out of prison her whole life, leaving the then-teen with very little financial support—and even less emotional—to help move her forward in life. She applied for and received a $30,000 scholarship from the Jack Kent Cooke Foundation among other prizes, and has since acquired even more money via honorariums and speaking engagements. Because of this Arrington’s education has now all but been fully covered, freeing her to turn her focus to making sure others have the same fighting chance she’s had. Enter ScholarChips, an organization she founded in 2011. It helps to raise money for the kids of incarcerated parents so they can go to college. A recipient of a 2012 Black Girls Rock! Celebration award, the honor student currently runs her 12-employee non-profit while participating in such wide-ranging extracurriculars as the Ghana Periclean Scholars, Black Culture Society and her school’s gospel choir, among other activities. She says her goal, through primarily donations and fundraisers, is to eventually expand ScholarCHIPS by creating a mentorship and networking component where recipients can interact and support one another for the rest of their lives. ESSENCE.com: Tell us about your cause? ARRINGTON: ScholarCHIPS is a non-profit organization that awards college scholarships to high school graduating seniors who have a parent or parents in prison.We started it with a $1,000 donation from a national youth organization. Since then my team and I have raised $25,000 more. To qualify students must have at least a 2.0 GPA and a letter of acceptance to the school of their choice. ESSENCE.com: What inspired you to start it? ARRINGTON: At first, because of my circumstances, I didn’t have the money to go to college. However I had my grandmothers helping me to apply for financial aid. One day I was sitting at the dining room with my maternal grandma, looking for scholarships online and she said, “You know, Yasmine, I really don’t see any scholarships for teens or high school graduates with parents in prison.” That’s where the idea came from. ESSENCE.com: Why do you feel so passionately about what your organization does? ARRINGTON: There was a story about me that was posted online awhile back and I read some of the comments underneath it. I was shocked and hurt by some of them. People had written things like, “Why do these children deserve special attention?” or “If parents didn’t have these kids when they were so young then maybe they wouldn’t end up in this situation.” Comments like that make me realize that a lot of people don’t get it. I’m here to help them understand that we can’t blame a child or a young person for the things their parents did. Also we shouldn’t put them in a box and assume that, “Yeah, they’re going to get pregnant by the time they’re 16,” or “They’re going to drop out of school.” Or that “They’re going to go to jail themselves so there’s no sense in even investing in them.” If no one else gave me a chance — if no one believed in me — I would have never have made it to school. That is why I’m so very passionate about making sure the children of incarcerated parents get a fighting chance. 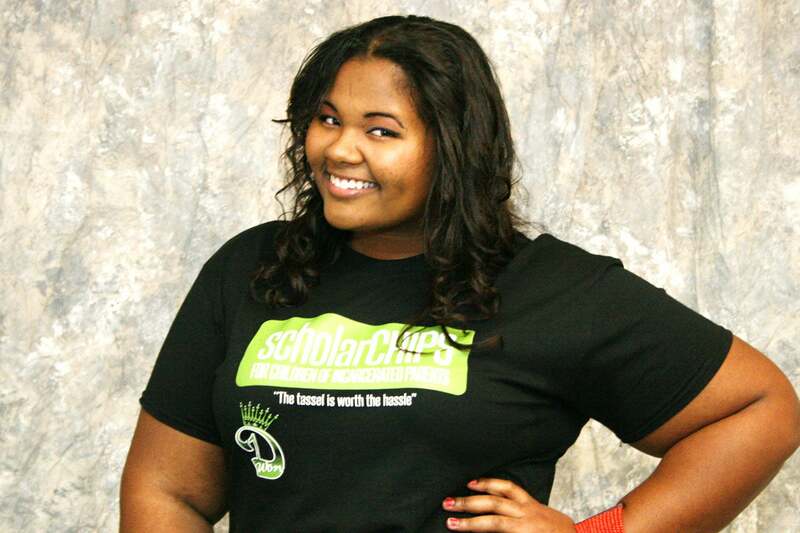 ESSENCE.com: Tell us about some of the students who have benefited from ScholarCHIPS? ARRINGTON: We have students at Chowan, Winston Salem and Old Dominion universities. One young lady has both her mother and her father in jail. They’re doing life. One young lady’s father was convicted of murder and is sentenced to death row. That’s really powerful stuff. I applaud them for being courageous enough to move forward with their lives. ESSENCE.com: What do you recommend to those of us who would also like to make a difference? ARRINGTON: I would tell folks to get involved — to decide where they can make a difference in someone’s life and just go for it. I am very blessed to have two grandmothers who are very strong forces in my life. They prayed for me all the time. I also have a church family backing me. Not everybody has that kind of support. You can be that support for them.